It’s been a whirlwind of a summer and I haven’t gotten as much sewing done as I would have liked. Over the last two weeks I have reorganized the studio and now I’m ready to sew again. I quilted Kit’s twin size quilt (and then bought her a youth size bed. 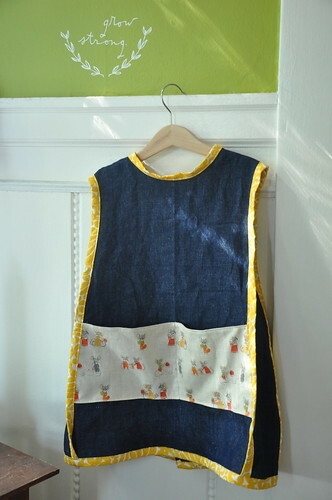 oops) and will be showing it once I have finished binding it, but in the meantime I’ve been playing with drafting a smock for my girl. In the past I’ve made the Oliver + S bias tape apron, but I wanted to go a different direction this time and drafted my own. The shoulders are nice and wide, but are straight for a good unisex look. I put a nice big split pocket in the front for trains and Playmobil people and other small treasures. 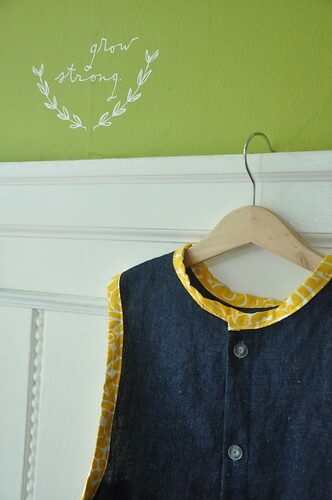 The smock and the pocket lining are made of indigo linen/cotton blend by Robert Kaufman – it’s fairly crisp right now, but will soften over time, as will the linen/cotton pocket fabric (now out of print by Heather Ross). 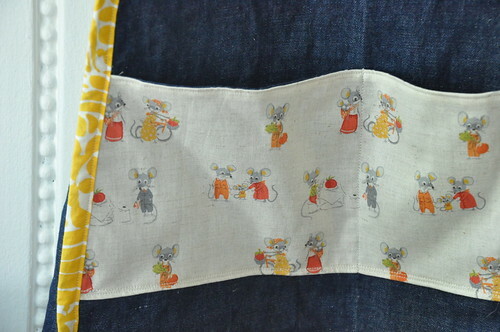 The bottom of the pocket as well as the divider stitches are both double stitched for durability. In my next version I might try some lightweight interfacing for comparison, but I think it’s pretty sturdy as is. I put buttonholes all the way down the back, because I like the full coverage it provides – you know, just in case someone decides pants are optional. The buttons on this one are vintage glass. I still need to put one more on the bottom because I was overzealous and broke one while sewing it on. I’ll have to get mismatchy on purpose unless the yarn store happens to have one more of these (crossing fingers). I think in the future I’ll stick to plastic or bone buttons for durability, but I couldn’t resist using these on my test smock. The bias trim is leftover from a quilt that I made for Lindsay so it’s a little wider than I would use in the future for these, but I wanted to work with what I hand. I had just enough to finish it – whew! It came from a Merimekko duvet cover that I bought at the now closed Crate & Barrel outlet for $10. I have gotten so much mileage out of that duvet. I’m sad that this half of it is gone. I still have some of the reverse side, which is the reversed print in white/yellow. It’ll probably be popping up on here soon. I made one stylistic choice that I have to ponder for a while – I turned the bias trim to the front and back instead of the sides so that it would have more of a rounded bubble effect at the bottom. I haven’t decided if I like it or not, because it goes agains the Rules. I figure it is easy to fix if I end up not liking it. It’s a little big for her now – I aimed for a size 3-6. It fits loosely, but will be great for the next couple of years, since she’s a little peanut. I’m guessing that it would fit a more standard size 3 year old better than it fits her. I may mess around with the sizing a bit for the next one. And I guess that’s enough hinting around. Kit and I are excited to announce that this is the first in a small series of useful garments that will be the opening line of sunshine + grey. 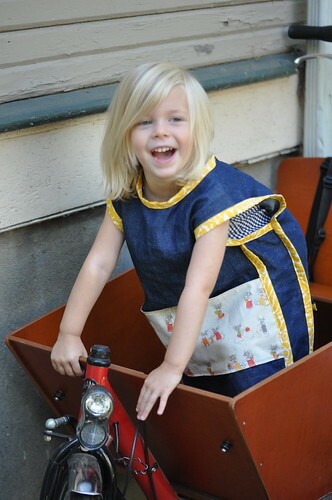 Each will be handmade with its own special details – fun trims, vintage or handmade buttons – but with a simple and easy style that works for active little people. I’ll be marketing them to local shops and selling a few online if there’s interest. So do let me know if you have interest and put my nerves at ease. I want to spend time here talking about process, because that’s what I do best – talk and process. Here we go! This is so adorable Sarah! Love the trim and roomy fit, and the coverage. And she makes for one super cute model! Looking forward to seeing your new line. Oh, I do believe Grace will need one of these. loooooooooove! 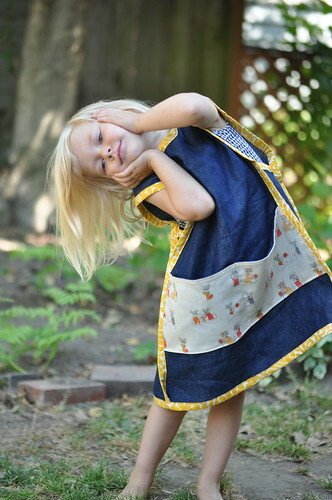 such a sweet little smock and with such attention to detail. can’t wait to see more of your work (and your cutie patootie model, too)! so exciting!! 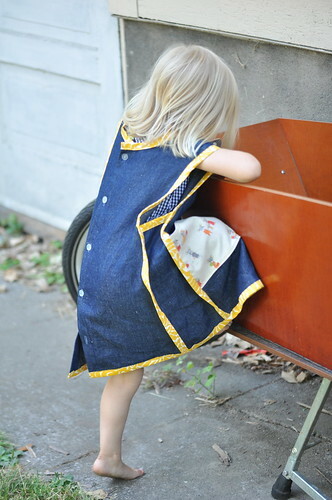 cheering you on from here… the smock looks wonderful and i can’t wait to see what else you create! how exciting sarah! cheers to your new venture! I love it! And Kit is just so adorable 🙂 Much luck with your new endeavor! Woo hoo! It’s adorable! And I’m cheering for you! I was thinking Benton needed one as I read the description. Miss you and that cutie.